This pattern will help you create a one of a kind quilted cover for a composition notebook. These are great for your own use and make wonderful gifts as well! 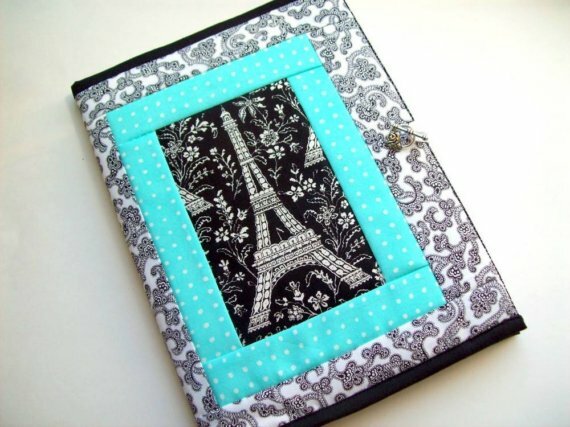 The possibilities are endless for you to create your own personalized journal covers for yourself, or for gifts. Just start with a focus fabric and you can make a keepsake that will be treasured for years. These are fun to make, and a joy to use and share. This journal pattern includes complete instructions for making a simple cover using a panel, or a pieced top of your own choosing. I also include tips for covering different sizes of notebooks (the pattern instruction measurements cover a standard composition notebook). These have been very popular as bible covers recently! Fully illustrated with photos of the journal on the front of the pattern in progress. Have fun creating your own covers, I allow you to use this pattern to make as many as you like to use, give as gifts, or sell. Thank you for supporting me as an independant designer!